People movers are unlikely to rate a mention when manufacturers talk of ‘niche’ products. Yet seven-seater medium-sized vans sell only 10 per cent the volume of similarly priced SUVs in this country, so they really are the alternative option for families needing to move more than five. But should you follow the crowd into an SUV? Or despite being unpopular do people movers actually make more sense? If they do, then which is the best model to bring home to the family? The catalysts for this comparison test are the just-released Citroen Grand C4 Picasso and Honda Odyssey, though the Kia Rondo only launched last year while the Toyota Prius V is three years old. The Rondo costs $38,990 in the flagship Platinum grade tested, while the Grand C4 Picasso comes only in a $43,990 Exclusive model. The Prius V and Odyssey have two-tier lineups, the costlier top models of which are the $46,490 i-Tech and $47,490 VTi-L tested here. There are battles on several fronts brewing between this quartet. For the first time in four generations the Odyssey has morphed into a van with sliding side doors, now stretching an SUV-like 4.8 metres long compared with its wagon-like competitors here that measure 4.5-4.6m. Safety is a priority for every family car buyer, and every people mover here has the basics covered. Equally, however, there are a few differences between them. Dual front, side and curtain airbags are standard fare, though only the Toyota and Honda’s curtains extend all the way to the third row, leaving the heads of rearmost passengers in the Citroen and Kia uncushioned during a side impact – a big consideration for larger families using the sixth and seventh seat often. The Prius V goes a step further by exclusively adding a driver’s knee airbag. Although all four get stability control that assists in the event of a slide, in addition to both front and rear parking sensors and a reverse-view camera, the Picasso and Odyssey both provide a 360-degree camera as handy for parking as it is for driveway safety. The Honda, Toyota and Citroen also include an auto-parking feature as standard, which can detect parking spaces and semi-automatically reverse-park themselves (moving the steering, leaving the driver to control the speed via the brake), ideal for your wheels’ kerbside safety. Those three contenders each offer a further standout safety feature. The Prius V i-Tech uses a front radar in addition to its sensors to detect if a collision is imminent and first give a visual and audible warning to the driver. Should no action be taken it will then automatically brake the car. A radar system with both features can be added to the Picasso for $2000, though the Citroen can only warn its driver of an imminent collision but won’t automatically brake. That option pack also includes features unique among these people movers, including a system that can detect if you’re wandering out of your lane and then alert you, a system that will tighten seatbelts if an accident is about to occur, and a system that will automatically dip your high-beam if oncoming headlights are detected. The Kia and Honda miss that lot of safety features, though the Odyssey VTi-L exclusively features a rear cross-traffic alert (that can use its sensors to detect if a car is coming when reversing between parked cars) and joins the Picasso in featuring a standard blind-spot monitor (that flashes a small light on each wing mirror if a car is lurking in your blind spot). Compared with similarly priced cars in other segments, these people movers are among the most generously appointed for safety features. Luxuries, too, are high priorities for these higher-spec model grades. Leather trim with front seat heating is standard on all but the Picasso, while the Odyssey VTi-L gets 8-way driver/4-way passenger seat power adjustment. Particularly notable given its affordable pricing, the Rondo is the only people mover here to include a 10-way power-adjustable driver’s seat with a cooling ventilation function, and a heated steering wheel. In the Picasso, part-leather trim comes packaged with ‘relax style’ front and middle row headrests, front seat electric lumbar adjustment, electrically adjustable passenger footrest and front seat massage function for $2500. Electrically adjustable front seats, meanwhile, are bundled with all of the above in addition to full Nappa leather and heating for $5000. The Citroen is the only people mover here with several other options, too, some of which are needed to match the Toyota and Honda. The Picasso asks $2000 for bi-xenon headlights, $1500 for 18-inch alloy wheels and $1000 for an electric tailgate. Xenons and 18s are standard even on the Rondo, and although the Prius V get smaller 16s and the Odyssey features 17s, both score full LED headlights. The Honda lacks a power tailgate, yet curiously gets side doors that slide electrically. The Citroen does, however, get standard dual-zone climate control with face-level vents for the middle row and a separate fan speed dial, along with side blinds and tray tables. Also standard is a full-length panoramic sunroof and a nifty removeable (and auto-recharging) torch in the boot. The less expensive Kia does, however, match every item with the exception of rear fan control. Only the Honda gets air vents for the third row passengers and a proper tri-zone climate control system with separate fan and temperature dials for the rearmost rows. The Toyota gets dual-zone climate control but, disappointingly, no vents at all for the second and third rows. Meanwhile the Toyota includes a fixed panoramic roof, where the Honda gets a small opening one. Above and beyond is the Picasso’s massive high-mounted 12-inch colour widescreen display (featuring a digital speedometer and tachometer) sitting atop another 7.0-inch colour touchscreen on the dash. The Kia matches the latter display, but gets conventional gauges in front of its driver and a 4.1-inch trip computer display between them, while the Toyota gets a 6.1-inch display. The biggest downside to the Picasso’s screens concern its ergonomics, as the driver must use the same screen that controls audio and nav functions to adjust the climate control; what in most cars is a one step process can be up to three in the Citroen. The Rondo’s smaller screens are high-resolution and the graphics high-class, but functions are easier to operate either via the touchscreen or illuminated steering wheel audio and trip computer controls. Only the Honda doesn’t feature integrated satellite navigation, though it exclusively provides a HDMI and Wi-Fi connections to enable it to connect with a smartphone and utilise its internet to access sat-nav. Honda has created a dedicated app that then shows the sat-nav on the Odyssey’s high-resolution touchscreen. Its infotainment system is easier to access than the Picasso’s, as the Odyssey has more fixed touch sensitive buttons bordering its touchscreen. Only the Citroen and Toyota feature digital radio, but while the colour touchscreen in the Prius V is easy to use, it doesn’t appear high-resolution and contrasts with the dated monochromatic display atop the dashboard that shows the speedometer, tachometer and trip computer functions. Here are four different takes on the people-moving theme ranging from conventional to quirky. Although it’s no great surprise that the Citroen Picasso fits the latter description, its interior also feels highly polished and well finished. Textured soft-touch plastics and matte-finished trim inserts are complemented by lined storage pins and tactile controls; the stubby, pen-like transmission shifter that clicks neatly into place is a particular highlight. No other people mover here (and few cars in any segment at this price) can match the Picasso’s flair and premium feel. The Kia Rondo combines a lot of the Citroen’s thoughtful touches with a more traditional but still tasteful interior design. The Rondo feels a cut-above the three-year-old Toyota Prius V, which looks dated with its textured hard grey plastics and grey leather, while the Honda Odyssey VTi-L is very well finished and delivers old-school luxury touches such as ruched leather and grey-tinted woodgrain. Turn to cabin storage and the Citroen leads again. There is a large box between its front seats that, when removed, has a smaller storage tray and cupholders beneath it. When removed it permits access to the rear of the cabin. Drawers under the driver and passenger seat are standard, while there are large floor bins in the middle row. The Kia leads the beverage holder count with six bottle holders and six cupholders, including one each on the flip-down tables for centre seat passengers, though only one for the third row. The Toyota gets nine in total, including one each for the sixth and seventh passenger, while the Odyssey is one down and gets the least front rear storage; there’s no centre console box, only a tray with two pop-out cupholders that slides down and under the dashboard when not in use. It is also the only people mover here to miss side sunshades. For powering everything from DVD screens to camping fridges, the Rondo also leads in the 12-volt socket count with four, double the number in the Odyssey and Prius, and one ahead of Picasso. 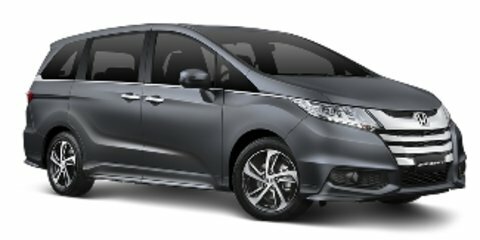 Passengers slide most easily into the rear of the van-like Honda (above and below), though. Its sliding van doors have the widest opening, and occupants will enjoy by far the largest cabin. The twin ‘captains chairs’ in the middle row include fold-down armrests on each side, and both can be moved further inboard to come close together. They can also each slide forward and back, and when the back bench tumbles into the floor they can go so far rearward that beyond a metre of legroom is available – more than a Mercedes-Benz S-Class limousine! With all seven seats in place the Honda offers between 250-410mm of middle row legroom and between 300-430mm at the rear, with easily the most comfortable seats of the bunch. A close contest only exists between the smaller models here, with the Citroen (above) proving the most spacious in its second row. As with the Kia (below), it features three individual chairs that can recline, slide and fold, but the French people mover offers between 210-360mm of legroom to the Korean people mover’s 110-280mm. The Toyota gets a middle bench split 60:40, though access to the rearmost seats matches the tilt-and-slide mechanisms of the others. It offers 160-340mm of legroom, but it also gets the most comfortable and supportive cushioning here. It’s a similar story for passengers out back. With between 100-360mm of legroom the Prius V doesn’t measure up quite as well as the Picasso (200-350mm) and Rondo (160-390mm). It does, however, eclipse both with its supportive seats and tilted bench that is superior to the relatively flat seats in its same-sized peers. The Toyota (below) is the second most generous for headroom after the Honda, where the Rondo conversely offers the least; anyone above 175cm will brush their heads on the rooflining. If multiple baby seats are required, it’s worth noting the Odyssey has four top-tether child seat anchorage points, one more than the others. The Picasso is the only one to get the more modern ISOFIX anchorages that are only just approved for our market. Even with rug rats occupying all three back seats, the Honda still provides a 330-litre boot, or about the same as that in a Mazda 3. The smaller trio can’t compete for boot volume, but their rearmost twin seats are split 50:50 so each can be individually folded. By contrast the rear bench of the Odyssey tumbles into the floor as a single piece, leaving owners to choose between using four or seven seats unless only the 40:20:40 split backrest is folded as shown below. The Picasso (above) has exactly half the boot space of the Odyssey with all seats in place, at 165L. 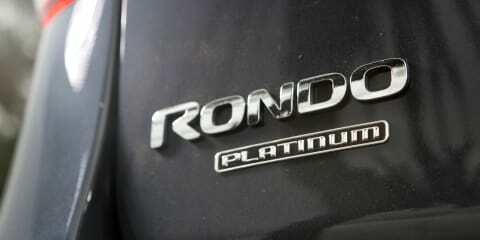 The Rondo offers about the same boot volume, the Prius marginally more than both (at 180L) but there isn’t much in it. In five-seat mode the Picasso’s boot eclipses that of the Rondo and Prius V thanks to clever packaging that includes a lower loading lip that makes heavy prams easier to lift in. The Citroen claims an SUV-beating 632-793L of boot space in five-seat mode, compared with the Kia’s 492L and Toyota’s 485L. The Toyota (below) and Kia (bottom) do, however, have smarter storage-cover solutions than the Citroen as their luggage roller blinds have a special underfloor spot where they can stowed when all seven seats are occupied; the Picasso’s has nowhere to go except inside the cabin or, more likely, to be left at home. The Citroen Grand C4 Picasso is the lightest people mover here at 1440kg, more than 100kg less weighty than the Rondo (1546kg) and Prius (1565kg), and around four burly bloke’s worth down on the 1819kg Odyssey. The Picasso also has the most torque, its 2.0-litre turbo-diesel engine providing 370Nm at a low 2000rpm. Put in context, the non-turbo petrol Rondo provides 213Nm but not until the throttle is pressed hard enough to have the tachometer showing 4700rpm, while the heavy Odyssey musters a similar 225Nm at 4000rpm. Only the Prius V comes close, providing 142Nm from its non-turbo petrol engine, supported by another 207Nm from its electric motor – though it’s not as simple equation as adding the two figures together. Torque means the engine doesn’t have to work as hard, so it can remain quieter and ask less of its transmission and its driver’s right foot. The Kia struggles even in an urban context. Its 2.0-litre petrol engine is sweet and flexible, but with just three bodies on board it needs to rev and kick back several gears inside its six-speed automatic transmission around town. On our windy touring road loop it was the only people mover to struggle maintaining an 80km/h speed limit on one hill. On paper, the Kia’s 10.8 second 0-100km/h claim is only a half-second off the Citroen’s but the real world driveability difference is more sizeable. A continuously variable transmission (CVT) helps the 2.4-litre petrol Honda feel quicker and less stressed than the Kia, because the gearbox simply kept revs closer to 6200rpm where peak power (129kW) is produced. It is very noisy up in that region, however, which could become tiring. The Citroen feels effortless and quiet, needing only 4000rpm to deliver 110kW of power. The Toyota sapped almost all of its battery power getting uphill with three aboard, the 73kW (at 5200rpm) from its engine and 60kW of its electric motor feeling like much less than its combined total, though its CVT also helped it feel more spritely than the Rondo, if not the Odyssey and Grand C4 Picasso. Although they have identical combined cycle fuel consumption claims of 4.5 litres per 100 kilometres, on-test the Toyota returned 6.3L/100km to be just edged out by the outstanding 6.1L/100km delivered by the Citroen. It was a decent jump to the Honda that returned 10.1L/100km, and again to the Kia that was clearly overworked and delivered a disappointing 12.1L/100km – a more sizeable difference than the claims of 7.9L/100km for the Rondo and 7.8L/100km for the Odyssey. Seat comfort and space for passengers is one thing; then there’s how quiet and comfortable people movers are for passengers on the move. For urban ride comfort the Citroen’s suspension is the most accomplished, generally compliant and only snagging its 18-inch wheels on the biggest of bumps. On rough roads, rear passengers reported a more jittery ride with some vibrations filtering through. The Prius V’s ride is the most soothing at speed, being settled especially over big hits, though around town it isn’t as smooth as it could be. While the Kia is more composed than the Picasso at speed, it is most prone to jar its wheels over potholes, and its urban ride lacks the finesse of the Citroen. The Odyssey has the least impressive ride quality of the bunch, at times feeling crude enough to suggest it has commercial-van origins. It heaves its rear passengers around over the slightest of bumps yet also feels unsettled. Up front there’s enough boominess coming from the rear to think a window has been left open. The Honda is also the least satisfying to drive. Its steering reacts quickly to turn in to corners, however although its sharp front-end implies a level of driving interest, it lacks cohesion with a rear end that gets bouncy and feels out of step with the front suspension rates. 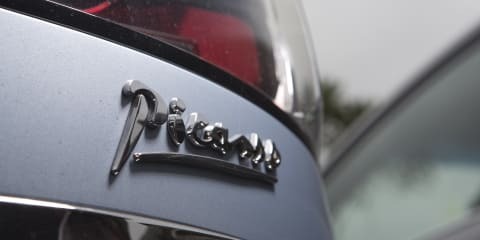 By contrast the Picasso is the most enjoyable car to drive, important for the odd driver who may not have considered a people mover because of the dull image they portray. It is stable, secure, yet entertaining, and gels well with the torquey engine and slick, light steering. The Rondo has among the most convincing suspension set-ups of modern Kias, feeling flat and planted on the open road, and even its steering is decently responsive (though it works best in the lightest Comfort setting rather than Normal or too-heavy Sport). 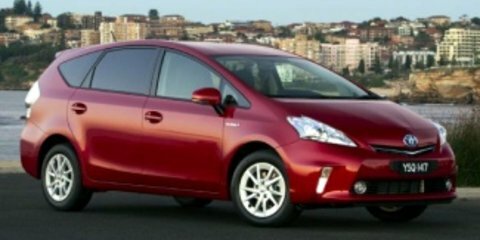 What makes the Prius V feel comfortable for passengers also results in soft handling in addition to average steering – it isn’t one for domesticated drivers who may have once had sporty hatchbacks in their younger years. The driver will not only love how the Grand C4 Picasso gets around, but thanks to a huge glasshouse and quick steering it is the easiest to see out of and park. Over-shoulder visibility is superb, and thin front pillars ensure vision when looking through round-a-bouts is first rate and refreshing when so many modern cars are difficult to see out of. The auto-parking feature worked as confidently in the Citroen as it did in the Toyota and Honda, though the Prius V is difficult to see out of and the Odyssey won’t fit into tight spots – something to think about if you live in a tight inner-city area without off-street parking. Thanks to front and rear sensors, a reverse-view camera and the shortest body here, the Rondo is no chore to park, either. Fuel economy will most closely affect the hip pockets of family car buyers, so based on the average 15,000km Australians drive each year, and unleaded priced at $1.50 per litre, the Kia will cost $2723 to fuel annually compared with the Toyota’s $1418 and the Honda’s $2273. Although it used the least fuel here, the Citroen requires diesel that is around 20 cents more expensive per litre, so it will cost $1556 each year to take second place after the canny Japanese petrol hybrid. For servicing, Honda and Toyota require six-month or 10,000km intervals, where Kia and Citroen only need annual or 15,000km check-ups. Citroen has the longest capped price servicing program that last for six years, where the programs from Kia and Honda last five years, and Toyota just three. Despite this, to three years or 45,000km the Rondo asks a neat $1000 of its driver, where the Picasso requires more than double – a hefty $2053 over the same period. The six services the Odyssey and Prius V require over three years or 60,000km results in $1553 and just $780 respectively. Although the Toyota costs about a third of what Citroen asks for servicing, along with the Honda it also has half the warranty cover – just three years or 100,000km versus six years, unlimited kilometres, eclipsing even the Kia’s impressive five year, unlimited kilometre cover to become the new industry benchmark. The verdict here comes down to how many people you’re moving, their size, and how often. The Honda Odyssey has the space and standard equipment to rival the top-spec Toyota Tarago and Chrysler Grand Voyager that cost beyond $70,000. In that light it’s excellent value, though its overall score dips when the harsh ride and noisy cabin are taken into consideration. Unless outright sprawling space is required, it falls short here. The size-smaller trio are better options if small sprog-hauling is the requirement, or if the rear seats are occasionally used for larger adults. Of the rest, the frugal, roomy and cheap to service Toyota Prius V is the most capable seven seater, though the lack of rear ventilation is as disappointing as the inclusion of curtain airbag protection for the third row is impressive. It is also expensive to buy and feels its age in terms of interior presentation and the way it drives. For the very reason that buyers avoid people movers – boring design, dull image – the Kia Rondo and Citroen Picasso should spark their interest. Their shared black marks concern a lack of third-row room (though it should be said they are no more cramped than most larger, heavier SUVs) and curtain airbags that don’t stretch back there. A slow and thirsty petrol engine prevents the stylish, ergonomic and great-value Rondo from edging ahead, so we’d accept a lower-grade model that is available with a turbo-diesel engine option. With the Citroen Grand C4 Picasso you pay a bit more up front and in servicing costs for the best people mover here. Particularly as a five-seater its boot is more spacious than any SUV, yet its clever and beautifully finished cabin also provides plenty of middle row room, its engine is effortless and economical, and it is as easy to park as it is enjoyable to drive. It’s certainly worth a look if you’re considering similarly priced SUV models.